These Gingerbread Crumb Muffins are soft and tender muffins flavored with a gingerbread streusel crumb in every bite! With a pop of spice from crystallized ginger in the batter, they’re perfect for serious gingerbread lovers! Holiday season is in full swing, and if you’re anything like me, you know time is of the essence this season. It’s easy to get wrapped up in holiday parties, shopping for gifts, and the traffic and drama that sometimes comes with it all. 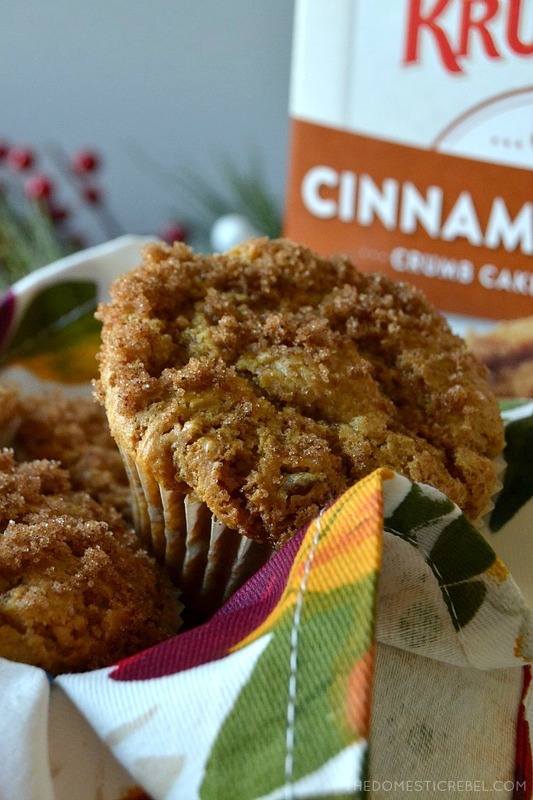 But I’ve got the perfect recipe for you in these Gingerbread Chip Crumb Muffins! As you know, I work with Krusteaz to develop unique and delicious recipes featuring their line of products. Because this time of year is also the time when family and friends come to visit from out of town, I realized we all needed an easy, quick recipe in our arsenal that’s both fulfilling, delicious, and can be made ahead of time so you can spend more time with your guests. Enter: these Gingerbread Chip Crumb Muffins. 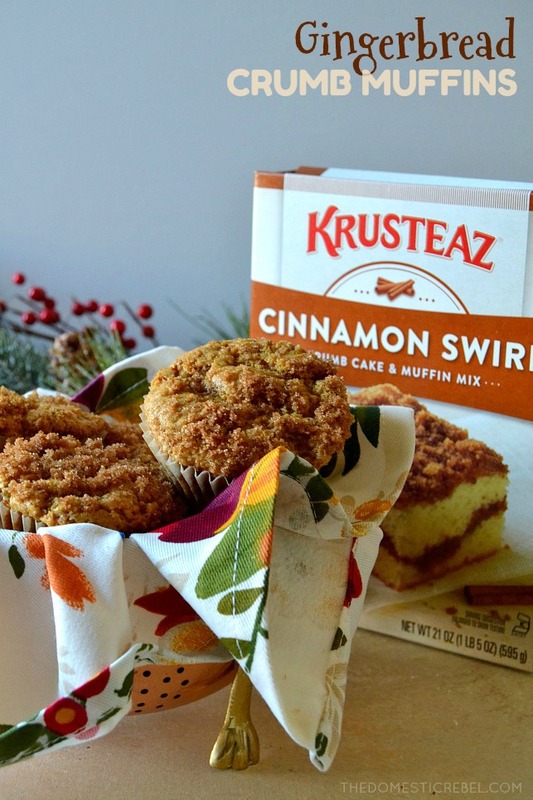 They start with Krusteaz’s Cinnamon Swirl Crumb Cake & Muffin Mix which can be found almost anywhere and is super flavorful. It turns out perfectly every time! However, this time they’re getting a seasonal flavor twist with lots of gingerbread spices and a hint of molasses. The ‘chip’ in these muffins comes from crystallized ginger chips, which are basically chewy, kind of crisp pieces of candied ginger that add such a lovely punch of flavor. Make a batch for your house-guests or give the muffins as gifts to neighbors, friends and coworkers to show them that even during the holiday chaos, you’re still thankful for them! These Gingerbread Crumb Muffins are soft and tender muffins packed with spicy, sweet gingerbread flavor in every bite! Preheat oven to 350 degrees F. Place 12 muffin liners into a standard muffin pan. Set aside. In a large bowl, stir together the crumb cake mix, water, molasses, and egg until blended. Batter will be slightly lumpy. Fold in the ginger chips. Distribute the muffin batter evenly among the muffin cups, filling about ⅔ full. In a small separate bowl, add in the crumb topping mix, ground ginger, ground nutmeg, and ground cloves and mix until blended. 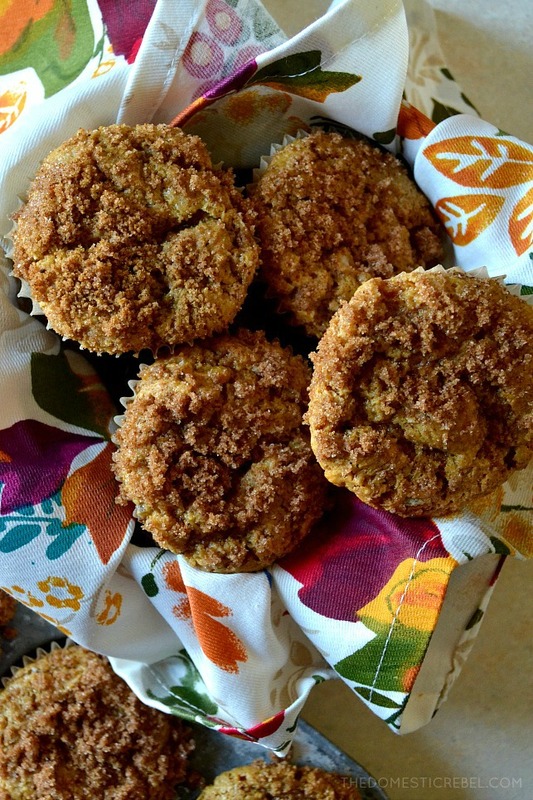 Sprinkle a liberal heaping tablespoon of the cinnamon crumb topping over the tops of the muffins. Bake for 20-25 minutes or until a toothpick inserted near the center of the muffin comes out clean. Cool completely before serving. Fluffy, soft, tender muffins flavored with rich, aromatic gingerbread spice… this is what the holiday season is all about! For more information on Krusteaz, such as recipes, tips and more, be sure to visit their website, or check them out on Facebook, Instagram, Twitter, and Pinterest! Disclaimer: I am a brand ambassador with Krusteaz. All opinions are 100% my own and I have been compensated for this post. Thank you for supporting the brands that keep my blog alive!